Yesterday’s pick for glory, Giacomo Nizzolo, was unlucky to be caught up by a late crash after having been manoeuvred into a perfect position late on and will now have to wait before trying to compensate for his misfortune as Stage 6 sees the roads now rise upwards. 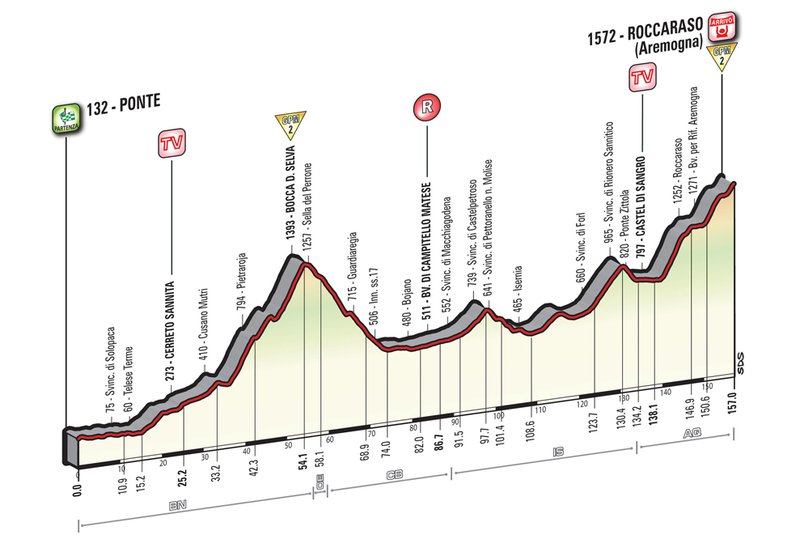 This 157km route from Ponte to Roccaraso features a couple of Category 2 ascents, the second of which forms the first serious uphill finish of this year’s Giro d’Italia. It will be a tricky stage to control as riders join the breakaway and stake an early claim to this year’s mountains jersey, while some of the lithe puncheurs will fancy taking the win here; possibly stealing some seconds along the way too. Alejandro Valverde is a specialist on this type of terrain and finish, arriving here in great condition as he mounts a serious charge for overall victory. The Spaniard’s team should come into their own on the ascent to the line, allowing Valverde to anticipate the perfect moment to attack after having seen the leading group whittled down to a select few. Ilnur Zakarin will be worth watching upon the climb to the line if the breakaway has already been caught, the Katusha rider can be very fast on finishes such as these, but could be limited by his threatening position on the general classification. Esteban Chaves broke through last year with wins on similar stages during the Vuelta a España and is certainly capable of repeating his endeavours once again in Italy. The smiley Orica-GreenEDGE rider is somewhat of an unknown quantity at the race due to modest riding in 2016, though will certainly hold no fear when it comes to attacking. Diego Ulissi and Tom Dumoulin have both demonstrated the great level at which they are riding at already during the Giro and remain in with a chance of taking a stage victory here. The breakaway or a late move also has a convincing chance of going all the way should the main bunch fail to piece together a coherent chase. Gianluca Brambilla, Jakob Fuglsang, Tim Wellens and Stefano Pirazzi could all capitalise on any freedom handed to them by the bunch. Posted on May 12, 2016 May 12, 2016 by Spokenforks	This entry was posted in Giro d'Italia 2016, News and tagged Alejandro Valverde, Astana, Bardiani CSF, Diego Ulissi, Esteban Chaves, Etixx-Quick Step, Gianluca Brambilla, Giant-Alpecin, Giro d'Italia Stage 6 Preview, Ilnur Zakarin, Jakob Fuglsang, Katusha, Lampre-Merida, Lotto-Soudal, Movistar, Orica-Greenedge, Spokenforks, Stefano Pirazzi, Tim Wellens, Tom Dumoulin. Bookmark the permalink.